We originally hadn’t planned to go to Hiroshima but I am glad we did. 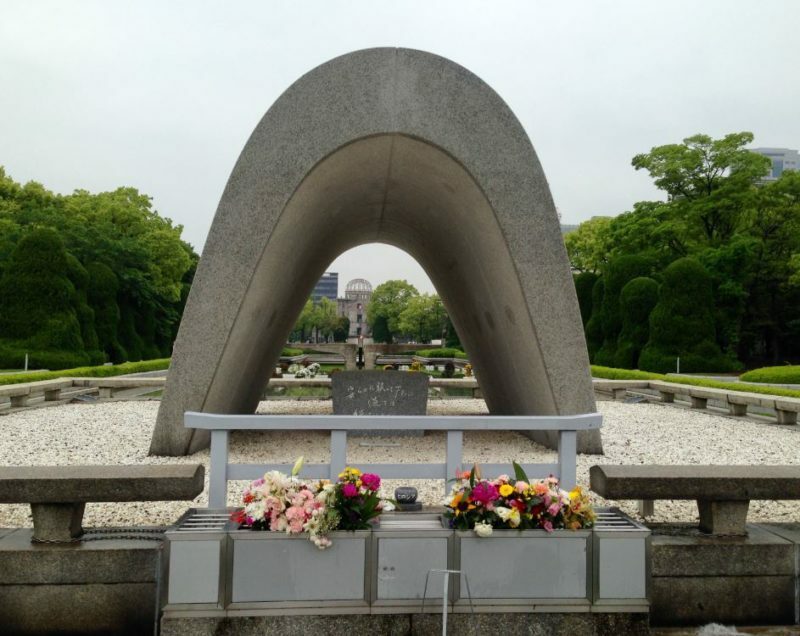 While Hiroshima definitely was not the happiest place we visited during our 1 month in Japan, it’s historically significant and therefore an important place to visit. I think it’s crucial to learn about the history of a country and the impact of that history on its people. Visiting Hiroshima was strange, it was bizarre to realize that in this very city an atomic bomb went off 70 years ago. And as always with heartbreaking places like this, I find it difficult to write about the experience. 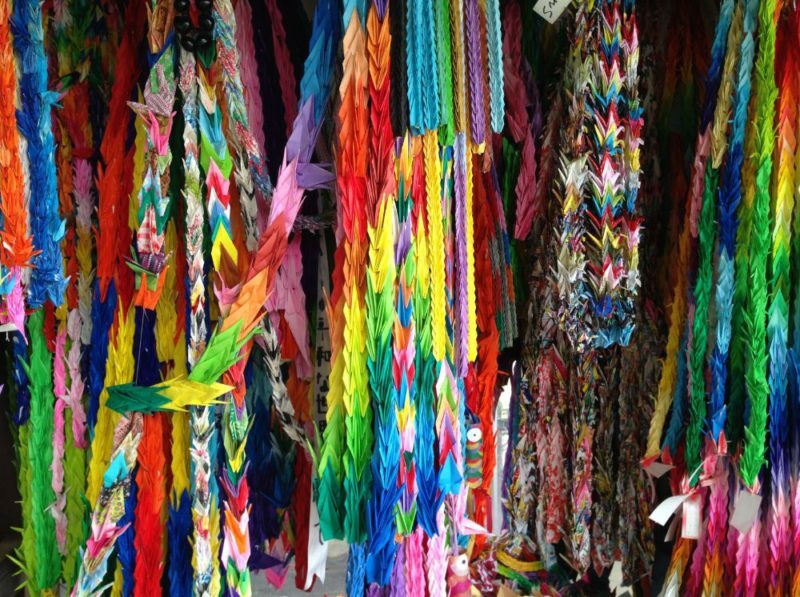 It’s challenging to put into words the strong emotions that well up when visiting places like Hiroshima. It is why I made a photo essay about the Tuol Sleng prison and the Choeung Ek Killing Fields in Cambodia instead of writing about it. I just couldn’t find the words and every time I think about this place I feel miserable. The same goes for the Cu Chi tunnels and the War Remnant Museum in Ho Chi Minh City and the Holocaust exhibition at the Imperial War Museums in London. When I came out of that museum I sat on the grass and cried for an hour, still not nearly enough tears for all the terrible things that happened during WWII. The Atomic Bomb Dome is an impressive sight. In the information sign you can see what the building looked like before the bombing. The atomic bomb exploded directly above the building, which is why it’s called the A-bomb dome. Before the bomb the building was named the Industrial Promotion Hall, it is one of the few buildings in Hiroshima that was left standing after the explosion. 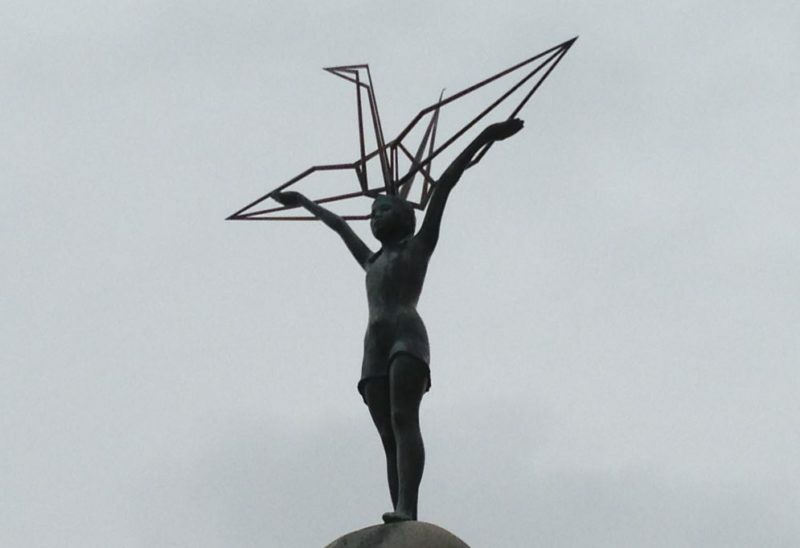 The Children’s Peace Monument is a monument to remember the children who died in the atomic bombing of Hiroshima. In the Peace Memorial Hall we listened to the haunting stories of people who survived the atomic bomb. It’s impossible to comprehend the amount of suffering and utter destruction caused by one single bomb. We also visited the Hiroshima Peace Memorial museum and red more about the horrors of the bomb, the effect on the human body, the amount of destruction caused and the impossibly high temperatures incinerating everything, even melting glass and metal. A depressing morning altogether but again, it’s important to visit places like this and remember the innocent victims of war. 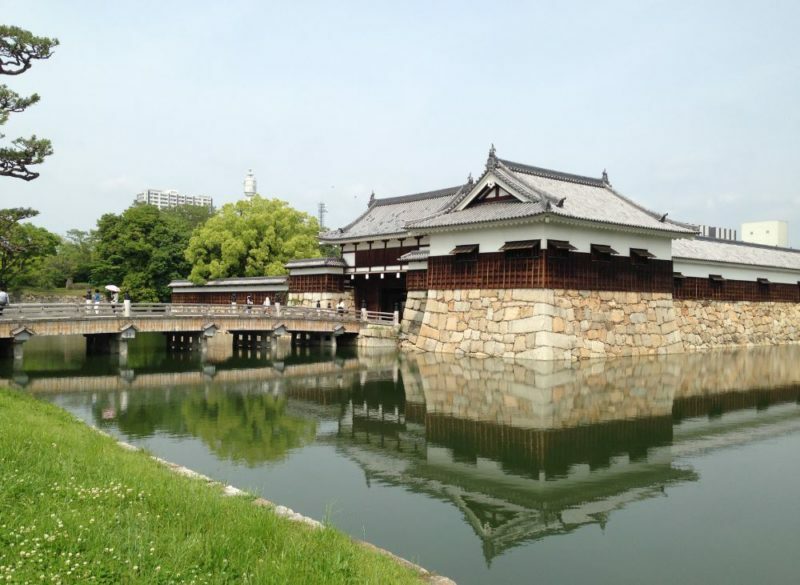 A happier place to visit is Hiroshima Castle, which has been completely reconstructed in 1958. The castle was also destroyed by the atomic bomb, but the reconstruction has been done perfectly (like you could expect anything less in Japan). 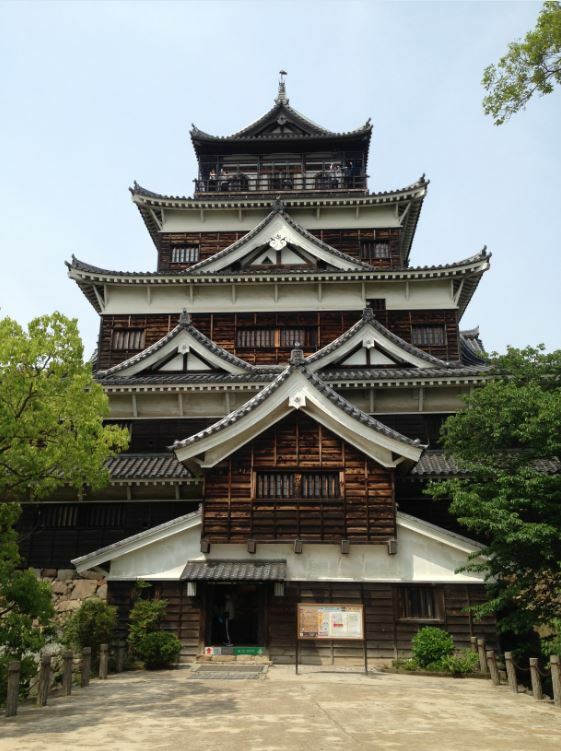 Inside the castle there is a museum where you can learn about Japanese castles and the history of Japan. 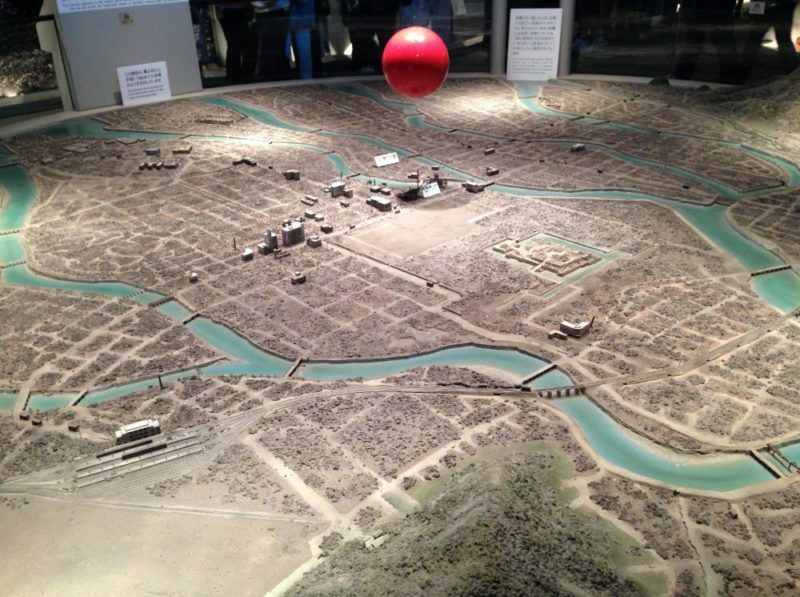 There is also a section about Hiroshima Castle itself and about the ancient history of Hiroshima (hundreds of years before the bombing) and the region around it. The view from the top of the castle is nice as well and despite it’s depressing history Hiroshima is a nice city to spend some time. It’s green, open and compact enough to explore on foot. I spent 1 day and 1 night in Hiroshima and traveled with my husband. Our trip to Japan was in April/May 2016. The exchange rate around that time was approximately €1 = 125JPY (¥) and $1 = 110JPY (¥). Accommodation: 33% of our costs. Transport: 29% of our costs (I allocated 1/5th of the costs of our railway pass, read more below). Food: 31% of our costs. 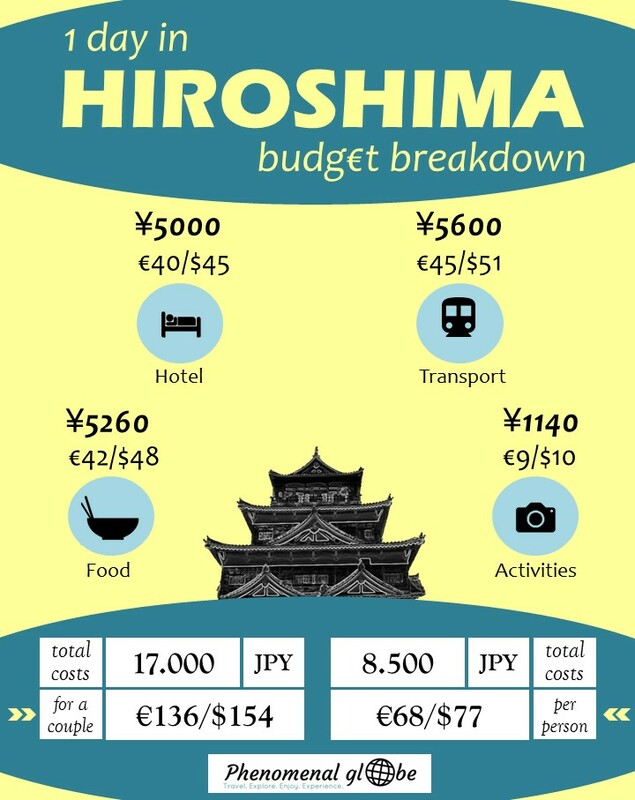 Activities: 7% of our costs (the entrance fee for the Hiroshima Peace Memorial museum was ¥200 per person and ¥370 per person for Hiroshima Castle). We bought a 5 day JR Kansai Hiroshima Area Pass, costing ¥14,000 per person. You can read more about this pass on the Japan Guide website and the JR website. 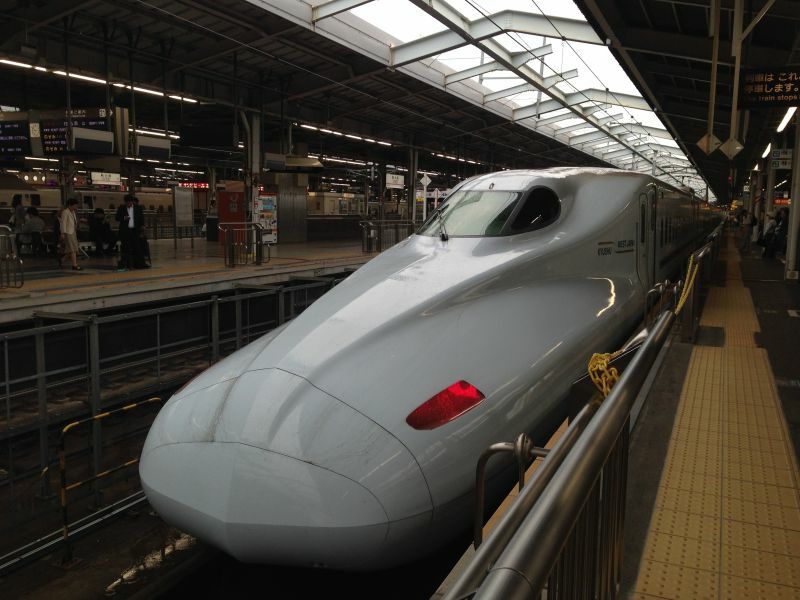 One of our Japan bucket list items was traveling on the famous famous bullet train, aka the Shinkansen. And so we traveled from Shin-Osaka to Hiroshima station in this wicket looking train! I can now say from personal experience: the bullet train is awesome! When it’s pulling up you wonder if, at some point, it will stop accelerating. It’s just going so fast (max 320 km/h)! In Hiroshima itself we got around on foot, the places to visit are near to each other and our hotel was situated between these sites and Hiroshima station, pretty much perfect. We stayed at the Hiroshima Pacific Hotel. Funny thing, we booked this hotel at Hiroshima station while having dinner and arrived about 30 minutes after making our booking. Nevertheless, our printed reservation lay behind the hotel desk and our check-in couldn’t have been smoother. True Japanese efficiency! 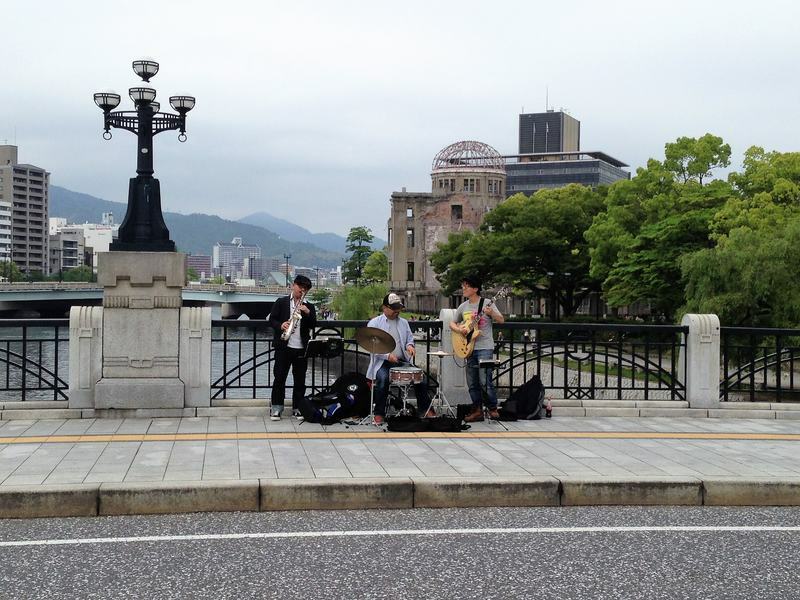 + Great location (within walking distance or the JR station, the Peace Memorial Park and Hiroshima Castle). + Free tea and coffee available. + Free luggage storage after we checked out. – The room was quite small, which was okay for us. We had slept in our car for 4 nights on Hokkaido, to us any place where you could stand up straight seemed pretty spacious?. But anyway, if you have lots of luggage this may not be the hotel for you. • Price paid for a night: ¥5000/€40/$45. We read about a great Thai place in the Lonely Planet and after some searching we found the tiny restaurant in a little alley. 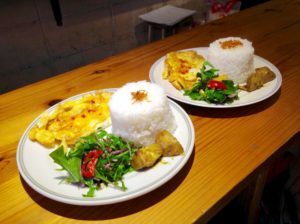 The set lunch menu consisted of a spicy green curry, rice, a little salad and an omelet, it was absolutely delicious! The Japanese lady running the place was very friendly and took a couple of pictures of us for the Facebook page. I still haven’t found that FB page, probably because he name is in Japanese. If you find it, let me know! If you have time (which unfortunately we did not) you can do a Thai cooking class: it’s a 3 hour class where you learn to cook 3 menus in a group of max. 5 people. 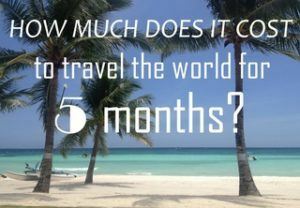 Costs are ¥5000/€40/$45 per person. 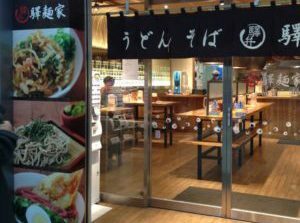 At the station of Hiroshima we found a great little ramen place between 7-11 and a donut shop. Order your dish the Japanese way by throwing in some money and pressing the button of the dish you like. More details how to order food in Japan can be found in this post. In the map below you can find all the places mentioned above (including the hotel and places to eat). You can download the map and the budget breakdown infographic below. If you want to read more about Japan, be sure to check out my other Japan posts!